Help! I have an insect nest. Step One: Identify the insect. 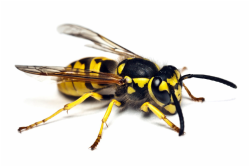 This is a wasp, commonly called a yellow-jacket. Nests are found in trees, in the walls and soffets of houses, in the ground, and occasionally in other unusual places. Nests are made of a grey-brown paper. 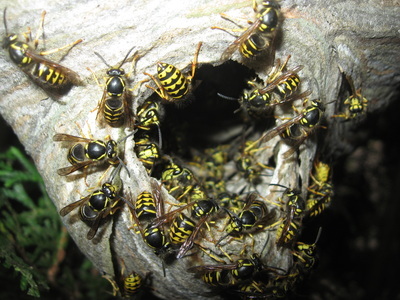 Yellow jackets are an important predator species. They prey on other insects, like flies, mosquitos and caterpillars that eat your garden vegetables. Find out about a removal here. This is a paper wasp; commonly described as the "wasps with dangly legs." This description is usually coupled with a greater sense of fear from callers, however, nothing could be more unwarranted. Yellow jackets (above) and hornets (below) are many times more aggressive than these beauties. 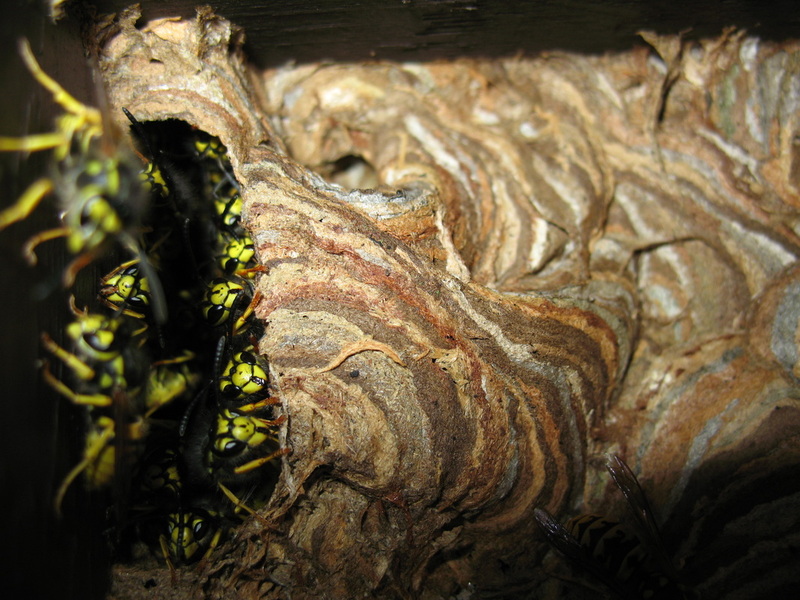 Paper wasps are actually quite docile; their temperament is more accurately compared to bees than other colonial wasp species. 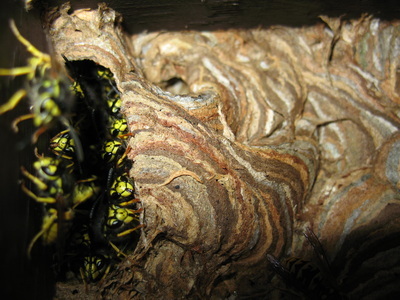 Contrary to what their name implies, paper wasps do not build paper around their nests. Nests are not covered in paper as with yellow jackets and hornets, but instead consists of one layer of exposed grey-brown paper comb. The nests are small and can be found in and under eaves, inside hand rails, and any number of other places. There are usually multiple colonies at any one location. Find out about a removal here. 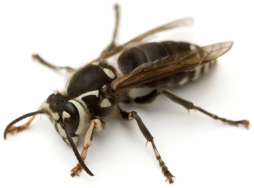 This is a bald-faced hornet. 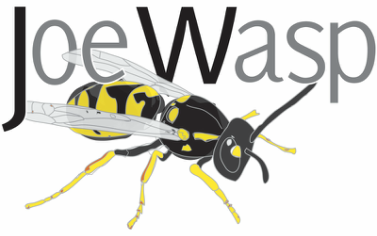 This species is noticeably larger than yellow jackets and has different coloration from the other wasp species commonly seen in the Lower Mainland. Nests are found in trees or attached to the outside of houses. 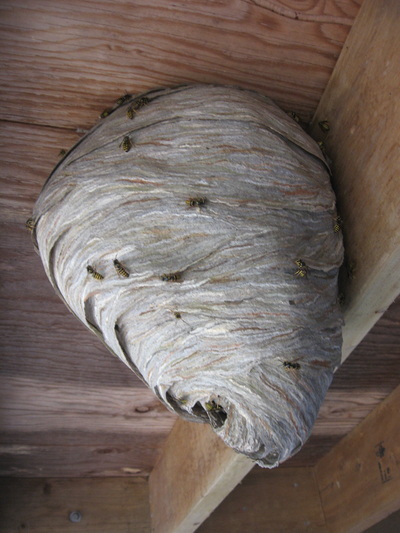 Hornets form a grey-brown conical paper nest. Hornets are an important predator species. They help to keep other insect populations in check. Find out about a removal here. 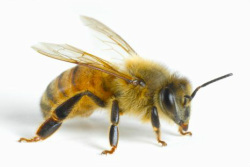 This is a honeybee. 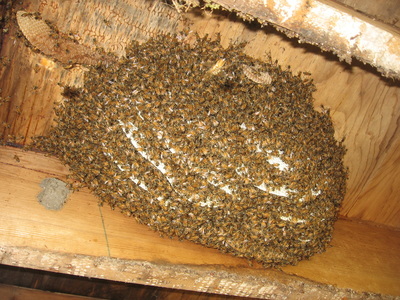 Honeybee nests are commonly found in hollows of trees, or in the walls and ceilings of houses. They nest in empty, enclosed spaces. Honeybee swarms are something different; when they are not a giant cloud of tens of thousands of bees in the sky, they form clusters that hang from trees or clump onto buildings. Swarms are not permanent, the bees send scouts to look for new places to live, and generally last a few hours to a few days. Honeybees are extremely important pollinators of food crops, being responsible for the production of 1/3 of the world's food crops. 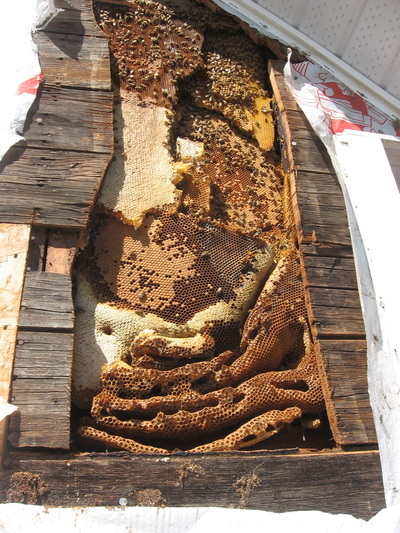 Honeybees are a protected species. These are bumblebees. 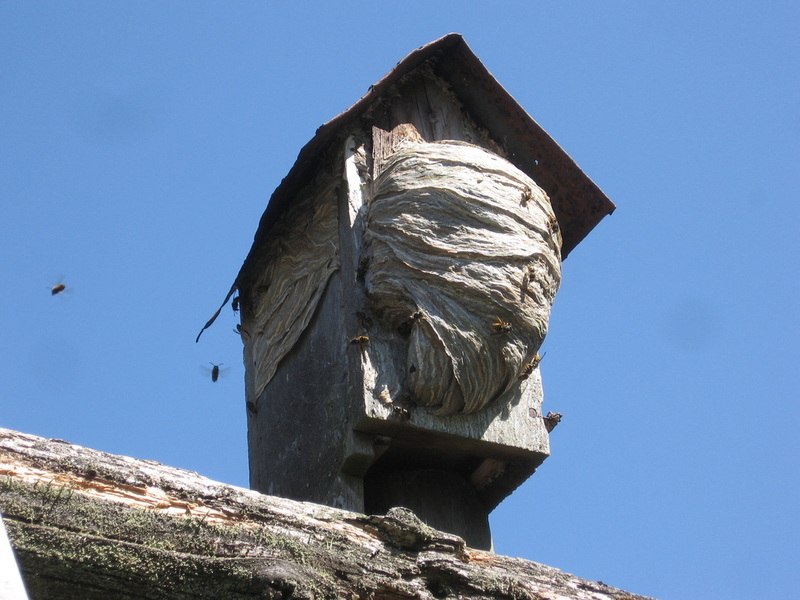 Nests are commonly found in birdhouses, composts, under sheds, and in the insulation of buildings. Nests are usually covered with insulation or other light material, but when this is removed they can be seen to consist of yellow, bulbous cup-like structures made of wax. 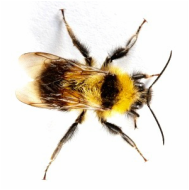 Bumblebees are important native pollinators of flowers and food crops. 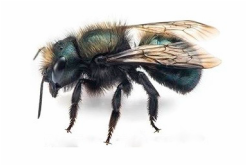 This is a mason bee. These are solitary, stingless bees that are excellent pollinators. Mason bee houses are commonly sold at garden shops. 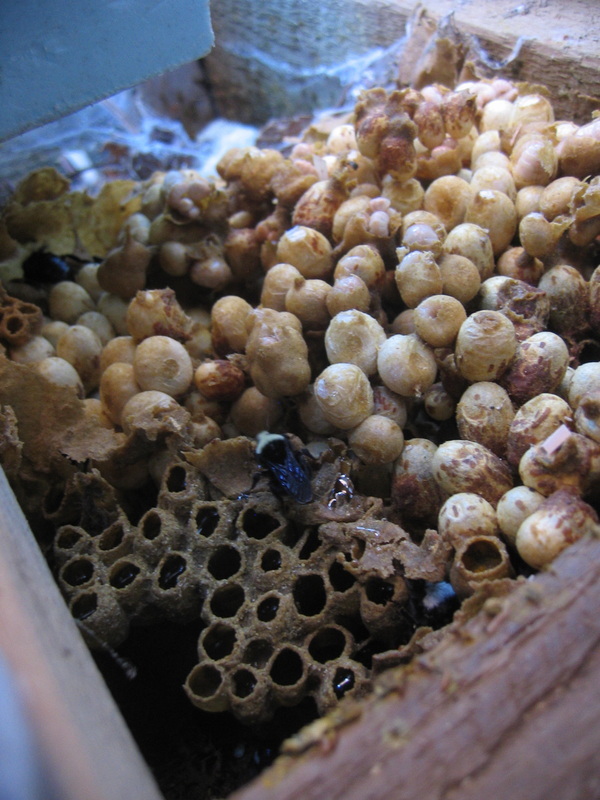 Mason bees nest in small tube-like spaces, sometimes nesting in the small gaps between shingle siding of houses. They are harmless, and cause no damage to structures. The procedure is to let them be. 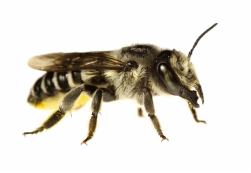 This is a leafcutter bee. They make small tunnel-like nests with several cells composed of rolled up leaves. Each cell houses a single egg with some pollen and nectar for the developing larva. They do not aggressively defend their nests. Occasionally we will receive calls for these solitary bees, but much like mason bees, our advice is to leave them be. This is an andrena bee. We very rarely get calls for these solitary, stingless digger bees, but when we do the bees are nesting in sandy soil, erupting from tiny holes. As with most bees, their human neighbours perceive them as a potential threat, and think the best thing is to get rid of them. However, like mason and leafcutter bees, these bees are harmless and are a tremendous benefit to ecosystems. They are great native pollinators and should be left to live out their life cycles in peace, even welcomed. how can you tell if you are seeing a wasp nest or a honeybee nest? Step Two: Identify the nest. 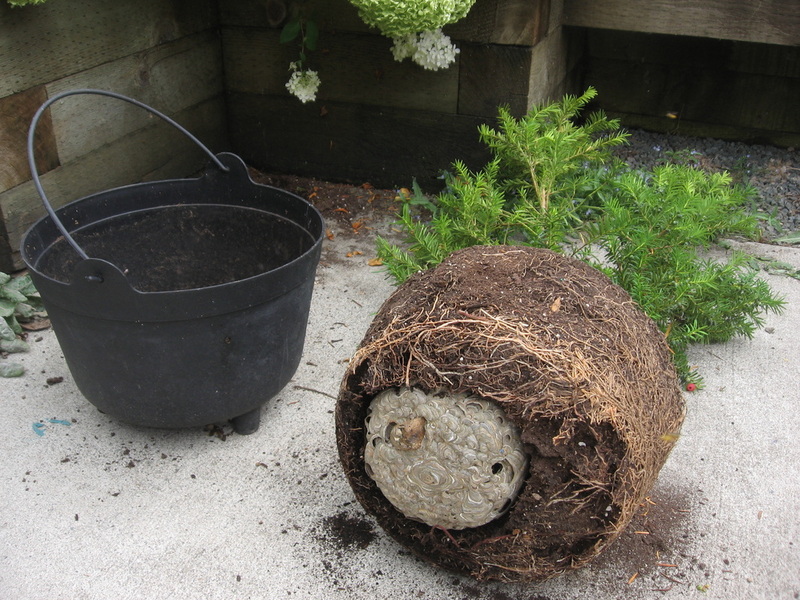 Although you have probably heard many people call this a "bee nest", this is actually a wasp's nest. This is a much more common sight than a honeybee/bumblebee nest. 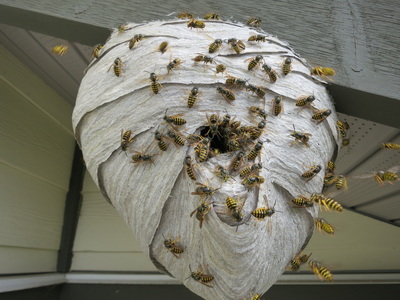 If you happen to see a grey or brown paper nest, you are seeing a wasp nest. 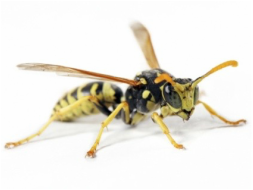 Wasps collect tiny bits of wood from fences or trees etc., chew the bits into a pulp, mix them with special enzymes and make paper. Inside the paper covering are horizontally oriented comb like structures made from a heavier, sturdier paper. Honeybees and bumblebees DO NOT make paper. They make beeswax. 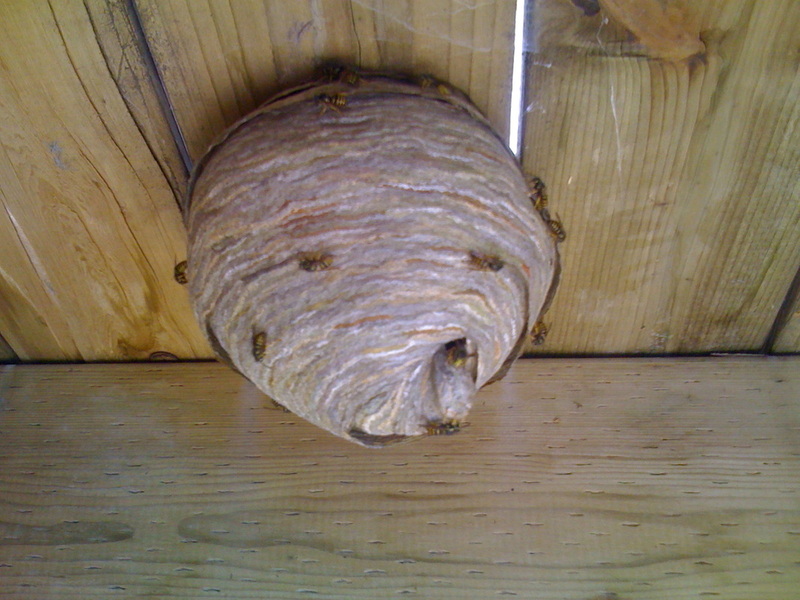 See more wasps nests here. Honeybees make their nests from wax that they secrete from special glands on their abdomens. Together they construct layers of hanging combs that are situated vertically. 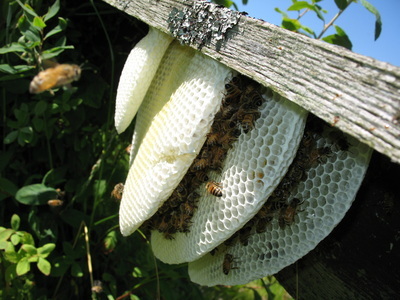 There are tens of thousands of honeybees per colony and they will almost completely cover the comb. 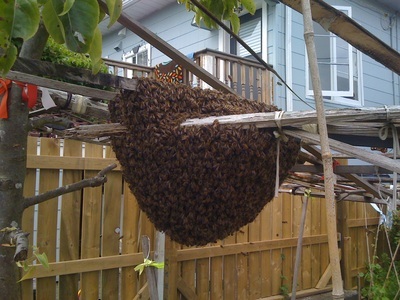 Whenever you see a huge clump of bees, it is honeybees that you are seeing. Wasps and bumblebees do not behave in this manner. See more honeybee nests here. Still not sure if you have bees or wasps?